Beyond the bright, flashing lights of Las Vegas you will find its lesser known (but equally eye-catching) artsy side. The Downtown Las Vegas Arts scene boasts local culture and flair you won’t be able to find anywhere else in the city. The Las Vegas art community has been creating, collecting and displaying quality and thought-provoking art for years. From established art industry organizations to those on the rise, Las Vegas exhibits are popping up everywhere. This local art can be found throughout the Downtown gallery scene in the Las Vegas Arts District 18b, as well as in the street graffiti and public art on display for all to see. Artists and art lovers alike are flocking to Las Vegas’ exciting art scene. Here is a breakdown of where to go to take in the vibrant scene and the art world’s focal players, from its public faces to those behind the scenes. The Arts District was formed in 1998 as a non-profit initiative to promote art, business, and residential growth. This initiative was vital in helping convert old warehouse and loft spaces into galleries and studios in the area. This cultural hub now spans 18 blocks, and is aptly named 18b. Its center is marked by the cross streets of Charleston Boulevard and Main Street, less than a mile south of Fremont Street. 18b is home to two high-rise apartment buildings and several restaurants, bars, art galleries, and creative businesses. Local buildings are adorned with elaborate graffiti art, which reflects the eclectic personality of the neighborhood. As the center (both geographically and creatively) of the 18b Las Vegas Arts District, DTLV Arts is a hub for unique and amazing galleries that represent the culture of Las Vegas. 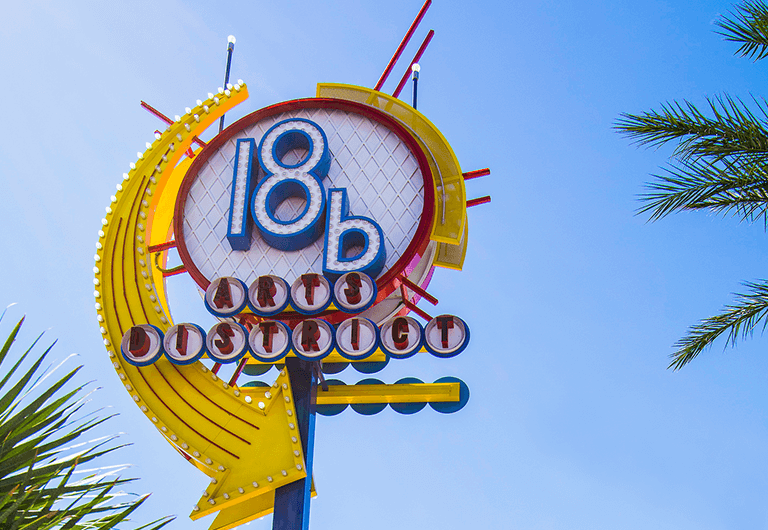 As the place to go for Las Vegas art, 18b is a district where artists, from contemporary to traditional, can go to really make their artwork shine! This creative community has the space for not only art, but also education, events, performances, and much more. At the heart of DTLV Arts Center is The Arts Factory , Art Square, Cockroach Theatre, Union House and the eclectic vendors that set up around 1st & Main. Every First Friday of the month, make your way through 18b to witness the artistic diversity Las Vegas has to offer. Indulge in a cocktail or amazing meal at one of the many restaurants and bars nearby. 18b is located halfway between the Fremont East Entertainment District and the Stratosphere Resort. It’s clustered around Main and Charleston, bounded loosely by Commerce Street to the West, Hoover Avenue to the North, Fourth Street to the East and Wyoming Avenue at the south. TastySpace is located on the first floor of the Emergency Arts building in Downtown Las Vegas. TastySpace is a gallery, boutique, and incubator all wrapped up into one unique location. As the “Home of Visual Awesomeness,” TastySpace is a unique environment for creative ideas to come alive. Enjoy a variety of work and pieces from a wide selection of artists, as well as featured shows throughout the year. “All great art creates a dialogue between the creator and the collector,” says owner Brett W. Sperry. If you’re looking for inspiration, beauty, and artwork, look no further than the Brett Wesley Gallery. Located in Art Square, this gallery represents a wide variety of internationally-recognized artists. Adding his own touch to the arts industry, Brett Wesley re-defines the gallery experience and displays bold and relevant work. Be on the lookout as the space develops a full schedule with how-to sessions, lectures, and special events! Founded in 2002, and calling the Neonopolis in Downtown Las Vegas their home since 2008, the Metropolitan Gallery Art Museum gives Fremont Street the art they deserve. Featuring over 20,000 square feet of exhibit room, the Metropolitan Gallery consists of three galleries all in one! The space is a hub for local, regional, and international artists to display their work. Don’t miss out on these exhibitions as you enjoy Downtown Las Vegas. Graffiti Art Gallery is known as one of Vegas’ best-kept secrets. This unique art “gallery” isn’t even located inside a building. In fact, it spans the back alleys of buildings in the Downtown Las Vegas area. Situated close to the Arts District, these ever-changing alley walls keep things fresh, providing visitors with new art on a regular basis. While this art gallery isn’t limited to one area, Main Street is a good place to start. 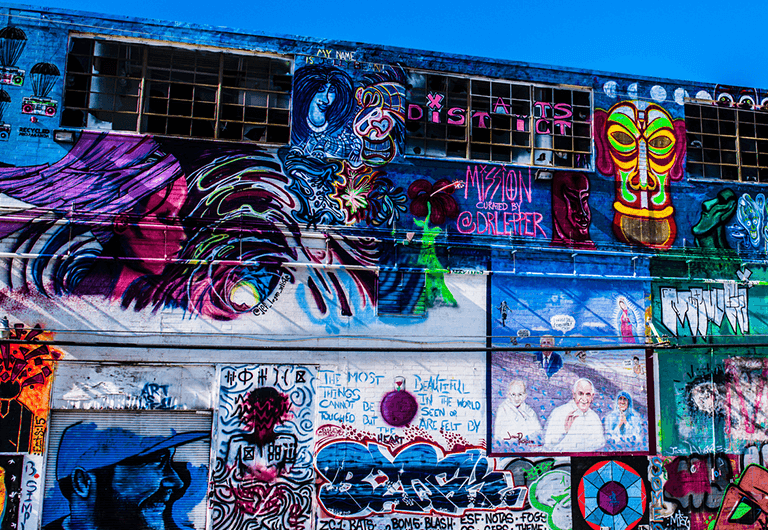 Graffiti Art Gallery is a fabulous go-to spot to capture that Instagram worthy shot! The Life is Beautiful Music & Art Festival contributes to the alley graffiti all around Downtown Las Vegas every year. So as you make your way through the area, notice the artwork from the festival’s 2017 artists such as Bicicleta Sem Freio, Broken Fingaz, Fafi, Faile, Felipe Pantone, Kevin Lyons, Mau Lencinas, Okuda San Miguel, thisismybworld and many more. As the 2018 festival approaches, keep your eyes open for new artists contributing a new line of murals for locals and visitors to enjoy! Another name to know when it comes to Life is Beautiful art, and art in general, is Shepard Fairey. You might know him as a contemporary street artist, graphic designer, illustrator, political activist, and the founder of OBEY Clothing. Another piece of artwork created by Fairey is the Barack Obama “Hope” poster that became a cultural phenomenon during the 2008 presidential campaign. 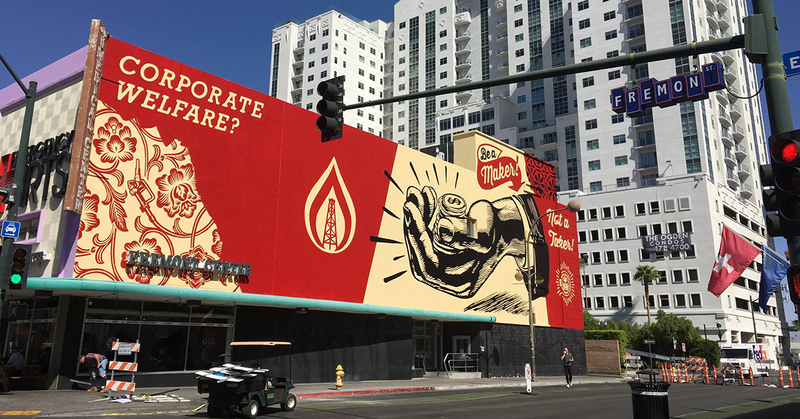 Catch more of Fairey’s work in Las Vegas along the side of the Plaza Hotel Casino, at the corner of Fremont St. and 6th St. in the Fremont East District, and even inside The Cosmopolitan of Las Vegas’ parking garages and stairwells to give the utilitarian spaces some extra color! Fairey is a truly amazing artist that has left his mark on Las Vegas. The Wonderland Gallery showcases the surreal, as its name suggests. It’s a popular place to visit during First Friday, given its proximity to the Arts Factory. Wonderland Gallery hosts group shows throughout the year to promote local artists and features collections from artists Lynne Adamson Adrian and Kat Tatz, as well as several rotating guest artists. Also in the Arts Factory, Lisa Dittrich features a variety of local artists at her new gallery space. From whimsical to gothic to obscure, Random Alchemy lives up to its name. An upcoming show in April will feature “Viva Vegas retro-kitsch” pieces from local upcoming artists. Craft-meets-high-artist Krystal Ramirez explores social justice and her own Chicana identity through her pieces. 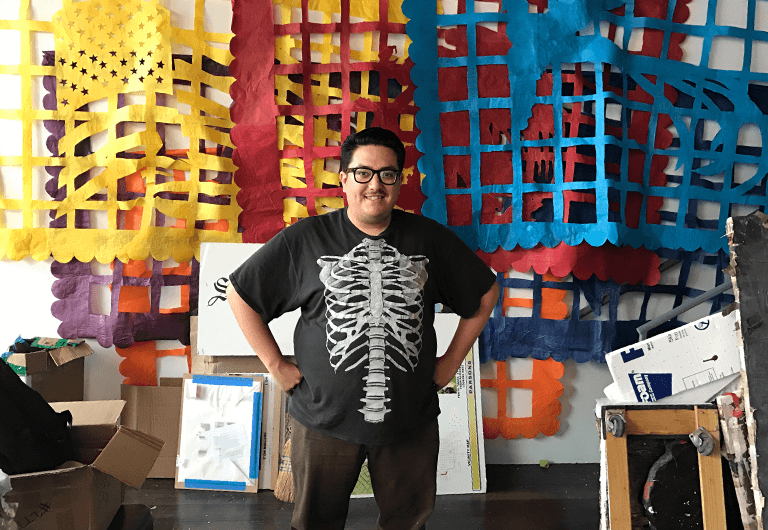 Ramirez was one of over 30 artists who submitted applications for Juhl’s 2017-2018 residency. She was chosen by a board consisting of Juhl’s previous residence artist, Justin Favela, Juhl co-owner Uri Vaknin, art consultant Michele Quinn, and the Museum at Symphony Park chairperson Katie O’Neill. She is the second artist to hold this residency. By day, Ramirez is a professional photographer but hopes to create a studio exploring new mediums. Krystal Ramirez’s installation “I Want to See” was a profound minimalist work, displayed earlier this year at the Clark County Government Center. The piece features Bible paper with the words “I want to see more brown bodies” written over and over in diluted white paint. Justin Favela is a Las Vegas native whose work draws from his Guatemalan/Mexican heritage, popular culture, and art history. Favela received his Bachelor of Fine Arts degree in Studio Arts from UNLV and works in the mediums of painting, sculpture, and performance. Favela was selected as Juhl’s first resident artist. He created a giant lime green car roof as a rendition of the 1964 Chevrolet Impala Sedan, which was featured in a 2013 exhibit celebrating Route 66. “Patrimonio” was exhibited in Las Vegas City Hall lobby, which showcases Mexican folk art featuring intricate patterns cut into sheets of tissue paper. Although his heart belongs to Las Vegas, Favela has participated in several exhibitions across the United States. Specializing in post-war and contemporary artwork, Michele C. Quinn has developed and grown within her career throughout the years. After developing a successful art career in New York City, Michele made her way back to her hometown of Las Vegas in 2003 in an effort to explore the new contemporary art opportunities in the area. Here, Michele has elevated Las Vegas’ status as a cultural arts destination through consultant roles with MGM Resorts International, Station Casinos, UFC, and the Bellagio Gallery of Fine Art. In addition to her commission works, public art installations with HINES, and her private client roster with some of ArtNews’ Top 100 Collectors, Michele co-curated Tilting the Basin: Contemporary Art of Nevada in 2015. As a certified member of the Women’s Business Enterprise and a member of the Association of Professional Art Advisor, Michele is a woman in the Las Vegas art industry that you want to keep your eye on. Visit her Fine Art Gallery today! Downtown Las Vegas has a booming arts district and our neighborhood is proud to house these artists and their galleries. At Juhl, we have restaurant owners, artists, and more living in our luxury high rise. To learn about securing your own residence, contact us today!